Two words. Two syllables. Six letters. One very powerful question. Whether it is intelligence analysts supporting military decision makers or business people looking at their own unique business challenges, they should be able to answer the question "So What?". The first time that I ask this question after someone has told me something they think is important, they look at me as if I'm slightly stupid. I can almost hear them saying, "Isn't it obvious why that's important?" It may often be obvious, but it is surprising how often their answer to that question is disagreed with by colleagues. The first person had made assumptions about the significance of that point that wasn't agreed with by the group. Resolving these differences can be incredibly useful for teams. When I was training intelligence analysts I would ask them to brief me any on important information in three parts. The significance of the information. What is it that makes this information important? The relevance of the information. How is the information relevant to the situation at hand? I often see people combine the significance of the information with the relevance of it. While this may work, it often leads to irrelevant information being considered just because it's important. The information may be important, it just might not be relevant at this moment in time for this issue. Discussing information in this way allows conversations around how significant a piece of information is and if or how it is relevant. Experience suggests that the conversations generated by discussing this, can significantly increase situational understanding and lead to a common picture. Alternatively, it may lead to the identification of clear differences of opinion within a team which can then be addressed and resolved. Information - There have been several changes to the composition of the Board recently and the CEO has only been in place for a few months. Significance - Relationships between the Board members are still forming and the CEO's understanding of them may be unclear. The CEO is still establishing herself in her new role. Relevance - The CEO is likely to take less risk over this decision than she might if she fully understood the Board dynamics. We should frame our position in a way that minimises the risk. This three-step way of looking at important factors can be applied to any situation, whether it's related to a change management programme, a complex sales situation or even looking at the leadership dynamics within your own organisation. I even used it to help me consider whether to leave the military after 22 years or whether to extend my service. Getting someone independent of the issue to do some of the questioning around information that is viewed as important can help reduce groupthink biases and challenge assumptions in a way that is difficult if it is only done internally. 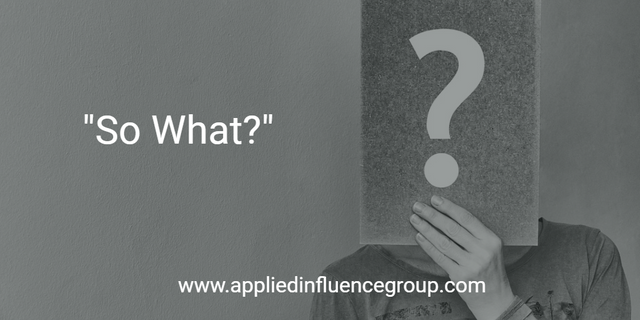 Next time you tell someone something that's important, make sure they don't have to ask you "So what?"